A person should be in the age bracket of 18-70, but if you are out of this range, we can then discuss the matter individually. Apart from the age, a person should be in good health. Medical requirements are not tough for tourist flyers. Although with an exception to those with a history of brain, heart, or/and back surgery. It’s pretty easy to clear the checks done by the medical officer present before the flight as it’s more of a formal inspection of blood pressure, general fitness, and just to testify your previous claims about your health. We suggest for you to get yourself medically checked with your local doctor initially. There’ve been lots of flyers before in the age bracket of 60-70 years and have done well in their flights. If someone by any chance feels squeamish or unwell, the pilot then takes the decision about the flight program. Taking your health into consideration, if serious, he may take you down safely. No medical certificates are required as such and of around 200 flights that have been airborne in the past 7 years, there has never been a single case where a flyer was rejected on medical grounds. 2. Where can I perform the Unique Flight in MiG-29 Jet Fighter? Are there any other places in the world for such flights? Such flights are performed only in one place in the world - at the Sokol airbase in Nizhny Novgorod, Russia (450 km from Moscow). Sokol airbase is not just a flight base - it’s also the birth place of MiG-29, so you can be assured maximum level of safety and service. If you want to fly the legendary and modern jet - welcome to Sokol! 3. What do you advise to get to Nizhny Novgorod? What types of transport do you have on that direction? What is the most popular way? There are several options to arrive to Nizhny Novgorod. You can fly through Moscow and get a train or a flight to Nizhny Novgorod. 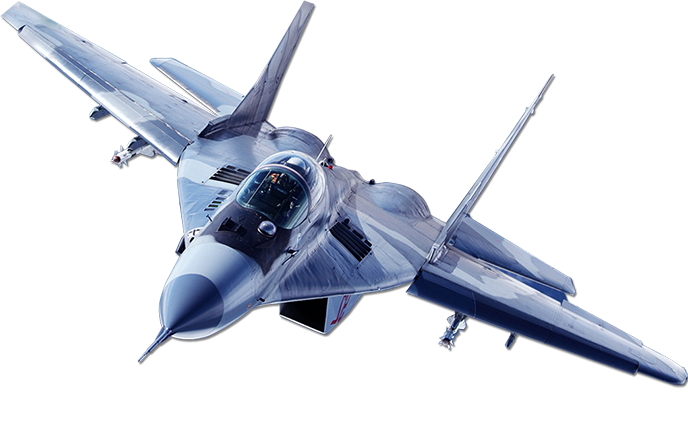 We offer MiG-29 packages based on 5 days via Moscow or 3 days within Nizhny Novgorod. Or you can purchase a Flight only and arrange all your travel details by yourself. You always have a choice with us. But the most popular and recommended package is a journey through Moscow. You combine a great flight experience with understanding of Russian life through an informative tour within its capital. Moscow is really a must see destination. And the airline flights to Moscow are cheaper. 4. Does your company provide all supporting touristic services or you sell Flights only? What is your customer service quality? We are a full service adventure touristic company and of course we provide all additional services for you. But if you want to buy just a flight - it is also possible. The level of our service is VIP, because all our clients are also VIP for us. We can provide you the contacts of our previous clients and you can talk them directly to receive honest feedback. 5. What are the time frames for MiG-29 jet flight booking and choosing of a flight date? Why is it necessary to book a flight in advance? You should book your flight and choose a date 65 days in advance. Such requirements are applied due to long Security Clearance process. Access to the Sokol airbase is restricted for civilians. We start reservations after we sign a contract with the client. 6. How serious are medical requirements for tourists? What happens if I do not pass the medical check at Sokol right before the flight? For what kind of health problems are such jet flights not recommended? Medical requirements are rather easy for tourists. You must understand that good health is necessary. But generally there are no special requirements. The flights are prohibited only for people who have had heart, back, and/or brain surgery. We are sure that you will be permitted for the flight at the medical check right before the flight; because it’s more of a formal inspection including blood pressure check and general briefing with a doctor about your claims. If you wish - you can check your health in advance with your local doctor. You don’t need to give us any medical certificates. There are a lot of tourists at the age of 60-70 years and they performed their flights in MiG-29 without any problems. These Flights have been organised for more than 7 years and there have been more than 200 flights already. There were no cases when tourists could not pass medical check or were not allowed to fly in MiG- 29. 7. Are there any age requirements for the MiG-29 Flight? Yes. To perform a flight you must be aged between 18 to 70. If you are out of this range, we can discuss it individually. 8. What are the types of payment for the Jet Flight and tour packages to Russia at your company? What guarantees do you provide for clients to confirm the safety of payments? 9. How much time does it take to prepare for the MiG-29 flight? The preparation time is about 2 hours and includes a briefing with your pilot about the flight program and manoeuvres, medical check, dressing to the G-suits, technical training about the aircraft, cockpit training. You can see the detailed information at Your day at Sokol airbase in our proposal. 10. Can I create my individual tour program? We will do our best to follow your requirements. Just contact us in advance and we will try to arrange the additional points in your journey and also in your MiG Flight program. Of course, your wishes are limited by technical security requirements. 11. What programs have you got for the flights? We have 4 main flight programs: MiG-29 Subsonic Aerobatic Flight (25 minutes) with all main aerobatic manoeuvres; MiG-29 Supersonic Aerobatic Flight (45 minutes) with strong aerobatic manoeuvres; MiG-29 Edge of Space & Aerobatic Flight (45 minutes) - the most great and popular program, including the flight to the Stratosphere for 18-19 km and the strong aerobatic. This program is one of the TOP-10 worldwide adventures (according to rating of World Touristic Association). Suborbital Space Training in MiG-29 (40-45 minutes) Great dark sky and Earth curvature view in combination with stimulated weightlessness, vertical take-off and real top-gun aerobatic!!! 12. What can I see at the Stratosphere? You will see the really dark sky, the border between land and space, the stars very close to you, and you will realise that our Earth is really a globe! The great open glass cockpit of MiG-29 will guarantee you a brilliant view at the top of the sky adventure. 13. How can I book a flight? Just contact us via e-mail, Skype, or just give us a call. We will be glad to assist you. 14. Must I possess a pilot license to be able to participate in a supersonic flight? No. Our customers range from experienced pilots to those who have never flown before. 15. Do you also offer a combination package with several MiG-29 Flights? Yes. You can make a several reservation package. 16. What kind of attire is appropriate? All equipment and clothes will be provided to you at the airbase. 17. What happens if I get sick and can’t arrive? We highly recommend you take out travel insurance for your trip in case you are prevented from attending due to illness. Then your out-of-pocket expenses may be covered by your travel insurance. 18. Will I get sick during a flight? Most likely not, provided you follow our simple guidelines. Less than 5% of people are actually sick during a flight. We ask that you avoid alcohol for 24 hours before the Flight. Eat light meals at the usual times on the day of the flight. Also avoid taking anti-nausea medication, as it tends to make you sick. 19. Are cameras allowed at the Air Base? No. Only an authorised camera man can film at the base. We recommend you to order DVD film and photos package together with your tour. 20. Can my friends or family members accompany me? Will be this interesting for them? What they will see? Of course, you may take 1-3 persons with you to see your MiG-29 Flight. They also must send us copies of their passports and questionnaires. They will accompany you at the air base; they will see your preparation before the Flight, medical check, changing clothes, etc. But they won’t be able to come close to the aircraft. They will see your taking-off and landing at the distance of 400 meters from the aircraft. 21. Does your company provide insurance for flying tourists? Yes. We arrange special insurance on any emergency Accident during the Flight. 22. Why are MiG-29 Flights so expensive? What is included in the price calculation? Can it be reduced? The price is strongly depended on the fuel price. Anything from 3 to 5 tons of fuel is used for one Flight. Also, about 120 employees of Sokol are involved in the Flight performance - security, navigation, doctors, firefighters, technical staff, pilot, special laboratories, etc. Your safety is our priority and we prefer not to compromise on this. 23. Can I purchase a MiG-29 Flight as a gift to my friend or girlfriend? Yes, sure. We have a system of Gift Certificates and you can arrange such a great and unique gift for your dear ones. This gift will stay in their memory forever. 24. Can women fly in MiG-29? Did you have ladies as customers? What programs do they prefer? MiG-29 is available for all and we have got a lot of pretty ladies who flew like top-guns. The best flight for women is our Edge of Space Flight, because it’s the most notable flight for unearthly impressions. 25. Are there any special seasons for the MiG-29 Flight? What are the best months to perform? MiG-29 flights are available all year round. But the best seasons for flights are in spring, summer, and autumn.